War Games Map Pack Access – The LE includes access to 9 maps that will be available as downloads when the game is released. Specializations – LE buyers will gain early access to specializations, which help players to achieve higher ranks in their Spartan careers. In addition to new ranks, specializations also offer new customizable features for your Spartan. If you choose not to get the LE, you will have to wait for the specializations to be released over time on Xbox Live. 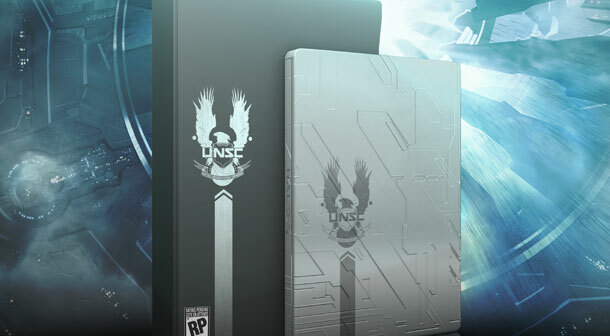 UNSC Infinity Briefing Packet – Includes an armor customization schematic, a blueprint of the ship, and an insight to the Spartan IV’s. Bonus Digital Content through Xbox Live – Unique in-game Spartan IV armor skin, unique in-game weapon skin for the assault rifle, exclusive in-game emblem, and Xbox Live avatar prop and IV armor. “Halo 4: Forward Unto Dawn” Special Edition – An extended version of the 90 minutes animated series that brings the Halo universe to life, including backstory leading up to Halo 4. And last, but not least, 3 videos will be available in the Limited Edition. Wow, that’s a lot of stuff. I may just have to get the LE, even though I already have the regular edition pre-ordered. This all looks so cool though, and I don’t want to be behind and have to get the stuff through XBL later anyway. I’m getting more and more excited for this game as time goes on. Excellent! I have a gift card and will be near my local GameStop tonight. Perhaps I’ll use it to preorder this! Thanks for the heads-up!